Buckingham Palace is the British monarch’s administrative headquarters, and has been their official London residence since 1837. Queen Victoria was the first British monarch to live in Buckingham Palace. 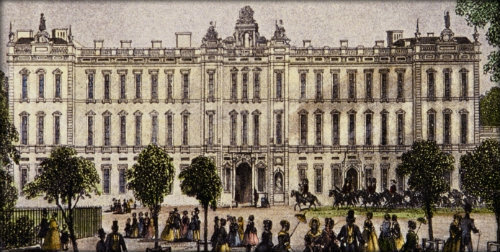 The building was originally called Buckingham House and it started off as a private house built in 1705 for the Duke of Buckingham. It is close to the centre of London, at the intersection of Constitution Hill, The Mall and Birdcage Walk. The Mall is a long tree lined avenue, traditionally used for Royal parades and funerals processions. The palace has almost 800 rooms, including 240 bedrooms and almost 80 bathrooms. Its rooms and corridors contain one of the world’s greatest art collections. The palace gardens are the largest private gardens in London. They cover 40 acres and contain tennis courts, a boating lake, a helicopter landing pad and over 300 species of flowers. During World War II, the palace was bombed seven times by the Germans. One bomb fell in the courtyard, just yards from the King and Queen. As part of the VE Day celebrations on 8th May 1945, the King, Queen, Princess Margaret and Princess Elizabeth (before she was Elizabeth II) appeared on the balcony of Buckingham Palace. They were warmly applauded. There are more than 350 working clocks and watches in Buckingham Palace. The palace also has its own chapel, post office, movie theatre and swimming pool. The palace contains over 40,000 light bulbs, although its residents are very concerned about the environment. LED lights are widely used and the palace recycles almost all its waste. Over 450 people work at the palace. The palace’s 760 windows are cleaned every six weeks. One of the brightest rooms is the ballroom, which is 100 feet long and almost 50 feet high. Over 50,000 people visit Buckingham Palace each year as guests of the Queen. Some famous visitors over the last 250 years have included Mozart, Gandhi, President Kennedy and Neil Armstrong. When the nearby 28-storey Hilton Hotel was built in 1963, there were concerns from the Queen that hotel guests could see into the rooms of Buckingham Palace. What next? Discover some more facts about London and its famous landmarks, or find out more about some other Castles and Palaces.